“Happy Saint Patrick’s Week.” That was the conclusion of the speech by the Irish Taoiseach (Prime Minister) Enda Kenny at the Westin Park Hotel on Tuesday night. The once religious holiday has become a week long series of breakfasts, lunches, dinners, panels, parades and receptions here in DC and in New York and Chicago. Ireland is deeply fortunate to not only have such a historic connection to the United States but to have a ‘day’ all to itself that warrants ‘celebration’ across the US (Irish pubs help). 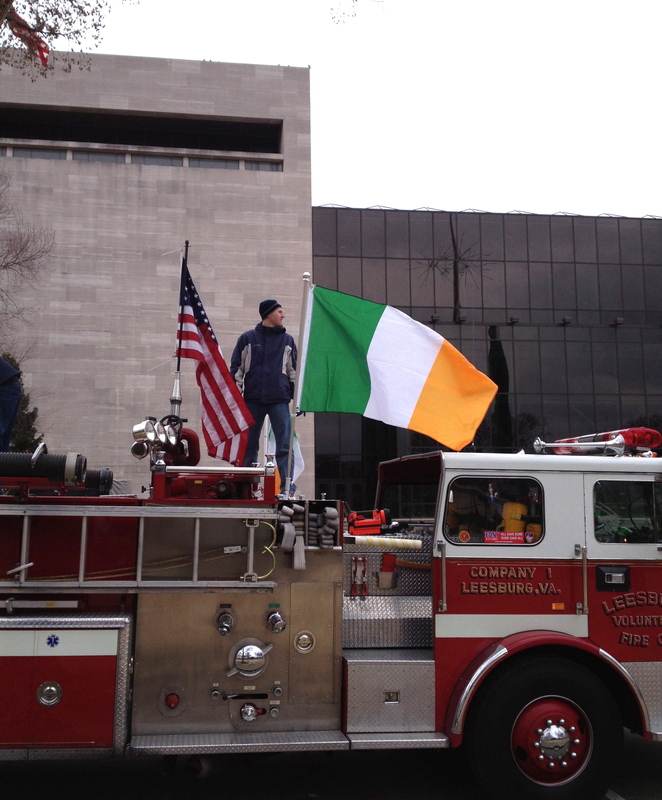 Irish politicians celebrate St Patrick’s by flying to New York, Chicago and Washington DC where US politicians oblige them by wearing green ties and accepting bowls of shamrocks (pictured above is one of the firetrucks that took part in the St Pat’s Parade on the Mall; no bowl of shamrock agreed to participate in this post). Amidst the frivolity there is an opportunity for some serious business and diplomacy. Immigration reform, foreign investment and tourism are major national interests for the Irish government, and as holders of the Presidency of the EU right now, it is also helping launch the Transatlantic Free Trade Agreement negotiations. But this year, the issue of unfinished business in Northern Ireland also got some attention. On Monday I attended a very informative Roundtable at Brookings with Professor Michael O’Flaherty on Human Rights in Northern Ireland. The discussion was particularly informative as I had not followed Northern Ireland closely for a while. I left with seven ‘takeaway’ points. Parts of the Good Friday Agreement remain unimplemented, especially the Bill of Rights. The degree to which Northern Ireland’s institutions are “Weston Park compliant” is a work in progress. The Civic Forum is moribund. There is a requirement on the state to provide good governance but social housing remains 90% segregated, 93% of kids go to ‘dominantly’ segregated schools and 99 security barriers are still in place across Belfast. Transitional Justice remains incoherent and spotty. There is a persistent problem with paramilitaries, as recent rioting over the display of a flag above City Hall in Belfast underscored. At this event and later I had the opportunity to meet the Finucane family. They are campaigning for a public inquiry into the murder of Pat Finucane, husband and father. For those unfamiliar with the case see here or read Ch 2 of Kevin Toolis’s Rebel Hearts. With commendable motives but also desire to ‘move on’ with a ‘resolved’ Northern Ireland, the British government has undertaken a series of inquiries into infamous episodes of the Troubles. Considerable media attention was devoted to the 5,000 page 2010 Bloody Sunday Report. Less well received was the Sir Desmond De Silva Report, released in December 2012, which Geraldine Finucane described as a ‘whitewash’. At least two issues are at stake, from what I can determine, in this case. The first is trust, legitimacy and ownership. Prime Minister Cameron did not give the family any input into the process of shaping the inquiry and determining who was appointed to run it. This was an avoidable mistake. The second concerns public accountability. From what I understand (a euphemism for ‘I haven’t read the report’) the De Silva Report is extensive and in-depth in its documentation of the shocking level of collusion between British security officials in Northern Ireland and Loyalist paramilitaries. Where it is reportedly weak is in exploring the role of political authorities in creating an environment where such practices could take root, and have sanction. This is understandably difficult for any state. The US, for example, has not held hearings on the sanctioning of illegal interrogation methods during the global ‘war on terror’ nor have any politicians faced public scrutiny for their role in ginning up dubious intelligence to justify the invasion of Iraq. But democracy needs public accountability and the rule of law inviolable standards of justice if it is to remain robust and legitimate. These issues transcend Northern Ireland. State security forces using special emergency powers to, in the end, murder their own citizens resonates with recent US debate over drones (see Ron Wyden’s questions). What powers should the ‘national security state’ have and who holds them accountable for their actions? When is suspension of law in the pursuit of perceived national security ends justified, if at all? The tragedy of the Finucane case is that British security officials helped direct the murder of a man representing an achievement of their/our civilization, namely the rule of law and the principle of innocence until proven otherwise. The inability to distinguish a lawyer representing ‘terrorists’ from the ‘terrorists’ themselves was, no doubt, a product of the sectarian atmosphere in Northern Ireland during the Troubles. Unfortunately, this polarizing sectarian attitude, this impulse to ‘paint’ individuals with orange or green, appears to still haunt this case: some refuse categories other than Republican or Loyalist, Them or Us. For evidence of this sad fact, one need look no further than the comment stream after Beatrix Campbell’s opinion piece on the De Silva report in the Guardian newspaper. Hopefully, the Finucane family will have the public inquiry they deserve. The strength and legitimacy of practices of political accountability will be the better for it. This entry was posted in Current affairs, Democracy, Northern Ireland and tagged British government, collusion, Good Friday Agreement, paramilitaries, Pat Finucane. Bookmark the permalink.